Summary: Misfits Dill, Lydia, and Travis are entering their final year of high school in Forrestville, Tennessee, each with their own dreams and burdens as they prepare to face life after high school. 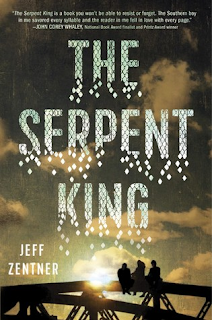 Dill Early Jr. has inherited a legacy of darkness and serpents - his grandfather, the Serpent King, went mad with grief and began hunting and killing snakes; his father, a preacher already notorious for his out-there brand of Christianity, was sent to prison for a detestable crime shortly before Dill started high school, and ever since, Dill's life has been a living hell, made only worse by the fact that his best friend/the girl he loves will be leaving town after she graduates. He's stuck in a town he doesn't want to live in, waiting for the darkness to consume him while everyone else moves on. Lydia is a majorly popular fashion blogger (but not to the jerks at their school), and she can't wait to ditch this backward town for NYU. However, she can't understand why Dill is acting weird towards her all of a sudden and why both of her friends have decided to resign themselves to their fates. Instead of trying out for the football team or doing something else befitting his large stature, Travis is far more interested in reading his favorite fantasy book series and connecting with other fans online. But even the thrill of meeting a cool girl online can't erase what he experiences at the hands of his drunken, abusive father. Told in alternating viewpoints, this story follows each character through their senior year, as a tragedy strikes that will change their lives forever. Thoughts: I got this book as part of my March Owlcrate, so I thought I better read it before I receive my next one :) But even before I got it, I knew I wanted to read this book, just because it sounded interesting. I was wiping tears off my face, and then turning the pages with wet fingertips. But before I get to that part, let me say that the worldviews and experiences of the characters in this book are so unlike my own. I am probably most like Lydia, but my life is so NOT "small, remote Southern town." I don't even practice any particular religion, so I can't relate to the issues of faith in this novel either. But that is precisely why I enjoyed reading this book. It's why I enjoy reading, period - if I stuck solely to what I knew, without ever venturing out to experience or understand people or places different from what I know, then my life would be extremely empty indeed. So I devoured this book because I was fascinated, in this world that was so different from mine, and in these three kids who are very much a product of that world, but with whom I could find commonalities anyway. The sadness that occurs is not just because of the tragic event itself, but because of the grief that flows afterward. This is a novel of endings and new beginnings, and you can't have a beginning without something else ending. So whether you're saying goodbye to a person or a period of time, there is going to be grief. But of course, endings can mean beginnings, and without spoiling too much, I will say that the bleakness does come with a ray of hope. The end of the book felt bittersweet, but it felt empowering as well. I definitely recommend this book - while it does deal with some very difficult topics, it also has many moments of beauty and joy.